Rainwater harvesting can be done on a small DIY scale with a rain barrel, but anything larger than that should require a professional who has the accreditation and experience. 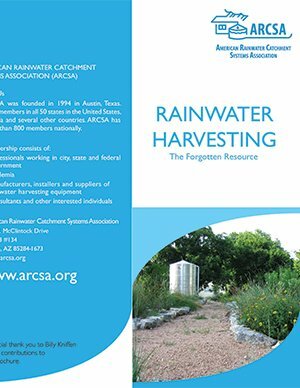 We recommend working with an ARCSA, American Rainwater Catchment Systems Association, Accredited rainwater professional to ensure that your system will be up to standard. 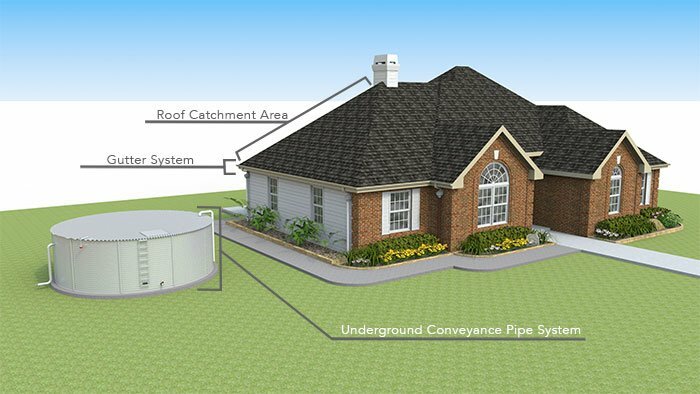 Rainwater systems are designed for these considerations. You wouldn’t want a system that stores too much or too little rainwater to fulfill your water needs. Some residential and commercial properties will run their entire water system off of their rainwater tank, while yet others keep it separate to supply a specific purpose like irrigation. The Rooftop Collection Area: True rainwater harvesting systems only use a building roof to collect rain from. Collecting water from anything else would probably be considered something else. The Gutter System: The gutter system needs to have a filter that removes organic matter, like seamless gutters. 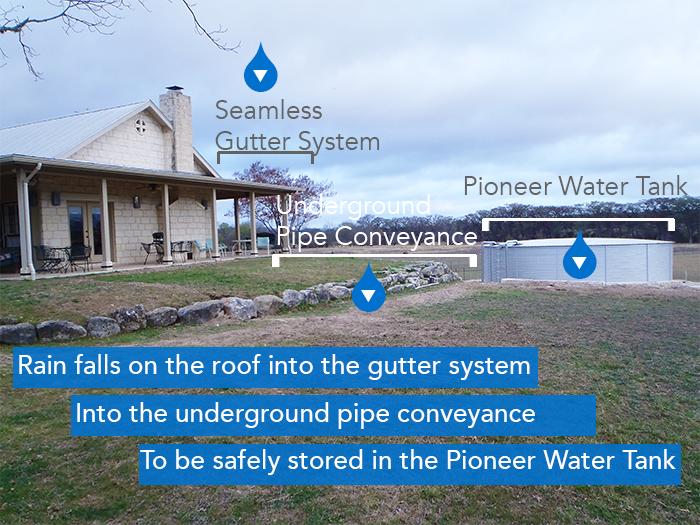 Downspouts and Conveyance: When a rainwater system is installed after a house is already built, the location of everything can determine where the rainwater system is located. Rainwater Storage Tank: Pioneer Water Tanks are the top of the line water storage system that ensures that your water is fresh and clean. Pump / Filters / Other Accessories: All of these things are entirely dependent on the system needs and what it will be used for. Some systems use gravity, while others use pumps and filtration. We supply Pioneer Water Tanks to keep rainwater fresh and clean for later use. Rainwater is protected within our exclusive AQUALINER® Fresh tank liner, that’s BPA-Free and NSF-61 Certified with antimicrobial technology embedded into the top layer. 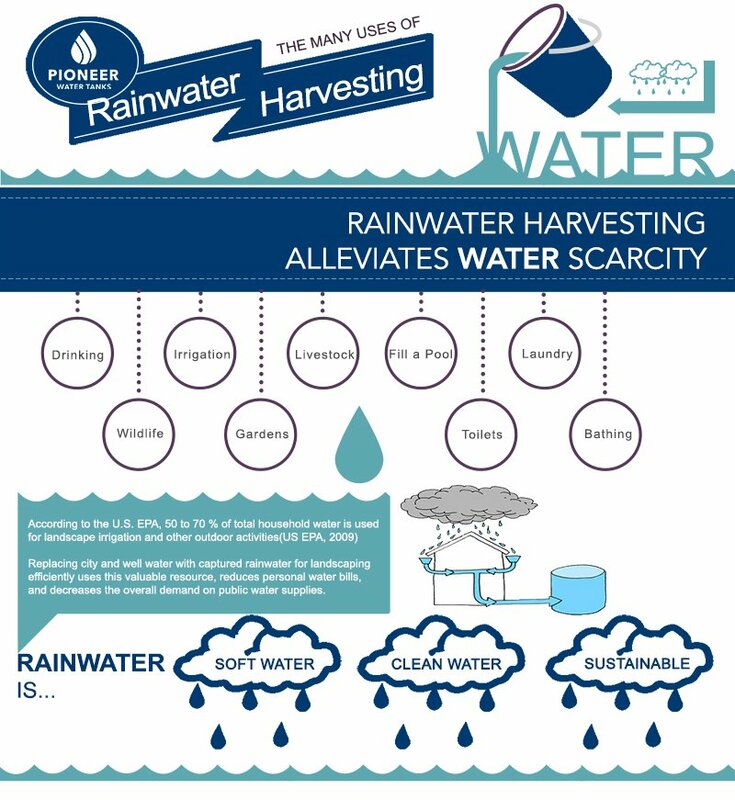 From storage to use, rainwater is used as a drinking water source and for domestic purposes worldwide. Turn your roof into a water collection source with rainwater harvesting. 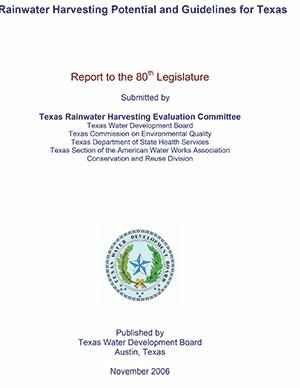 Texas has one of the most comprehensive laws protecting rainwater harvesting, the Texas House Bill 3391. 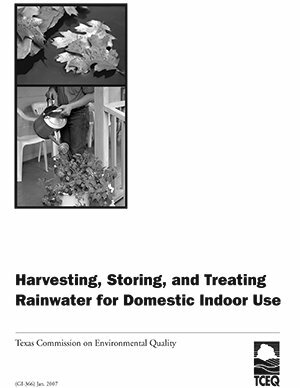 In 2001, Texas excluded components of rainwater harvesting systems from sales tax, Section 151.355 of the Texas Tax Code. - Provides a clean, pH balanced water source that is free of salts and other minerals that can harm plant root growth. Rainwater harvesting can be used both in large-scale landscapes, such as parks, schools, commercial sites, parking lots and apartment complexes, and for personal home use. 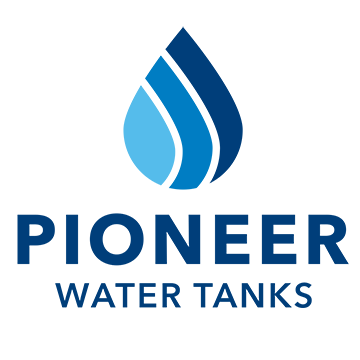 ARCSA, the American Rainwater Catchment Systems Association, is a nationally recognized accredited professional organization that can certify that the company that you work with will design and install a system up to standard. 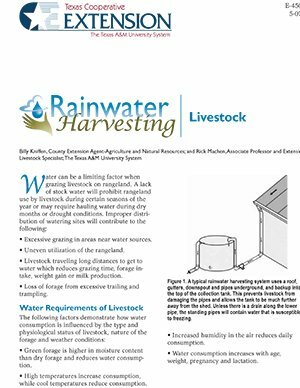 The following are a few of the vast array of free resources and manuals about rainwater harvesting. All of the resources above are linked below with the full urls listed. Our local dealer and installer network provide rainwater systems across Texas for homes and businesses. Call or fill out the contact form to get started. Pioneer Water Tanks comply with NFPA 22 standards for fire protection water tanks. The tank body and roof are made of Zincalume® Steel, proven to withstand fire immersion. Our full lines of firefighting adapters and nozzles are compatible with fire hoses across North America. Commercial and residential properties that do not have an adequate water supply for local authority requirements can be supplied with a water storage tank for a building permit. We offer optional engineering packages for the permit process when needed. Our engineering packages are based on for the project and application. 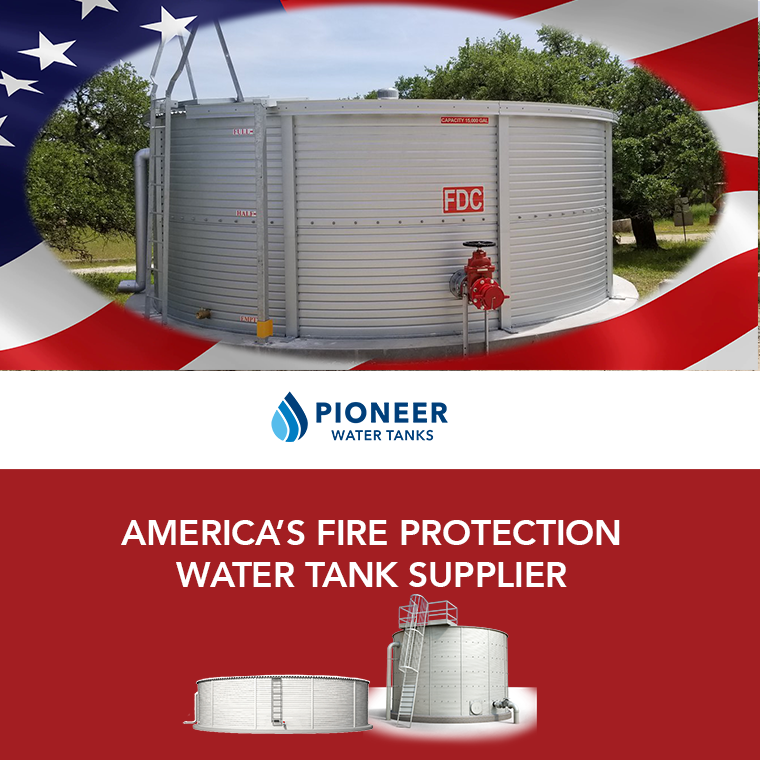 Why Choose Pioneer Water Tanks for Fire Protection? 1. 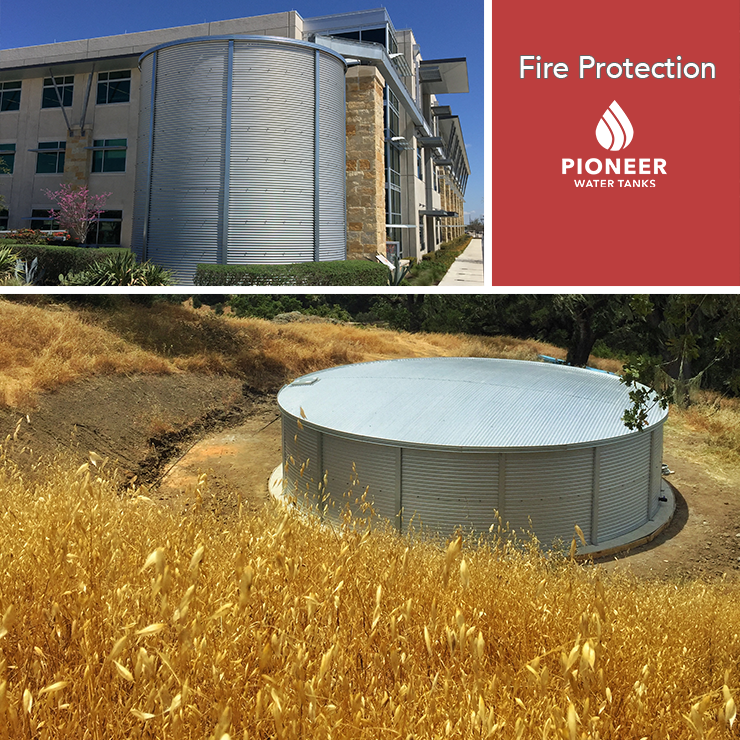 Pioneer Water Tanks are used for fire protection as the longest-lasting water storage that can double as a drinking water source. 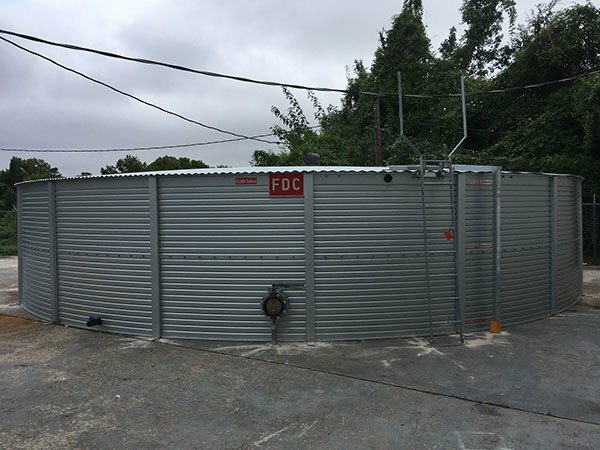 Our fire protection water tanks work well with local fire code authority requirements and our optional engineering packages make the permit process easier. 2. Pioneer fire-protection tanks are designed to exceed NFPA National Fire Protection Association standards, as required by the American Fire Code, for fire-water storage. Fire protection packages come with a complete set of engineer-approved drawings. 3. 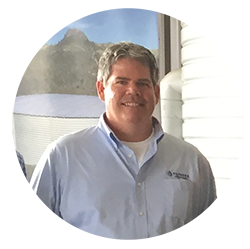 Pioneer offers a wide variety of water-storage options with capacities ranging from 3,000 to 1,000,000 Gallons. Pioneer Water Tanks are backed by our industry-leading warranty, so you can rest easy knowing you have a fire-protection solution that will last. 4. Pioneer Water Tanks are made of Zincalume® steel that has been proven to withstand fire immersion and resist corrosion, ensuring the safety of your water supply in even the worst emergencies. Our full line of anti-vortex and fire-fighting adapters ensure water is always available for quick access during a fire emergency. 5. 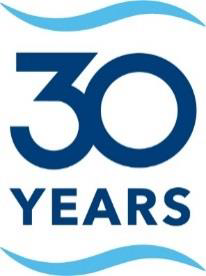 Pioneer Water Tanks’ 30-Year dedication to providing the longest-lasting water storage that is always ready, works well for the rough environment and for commercial applications. 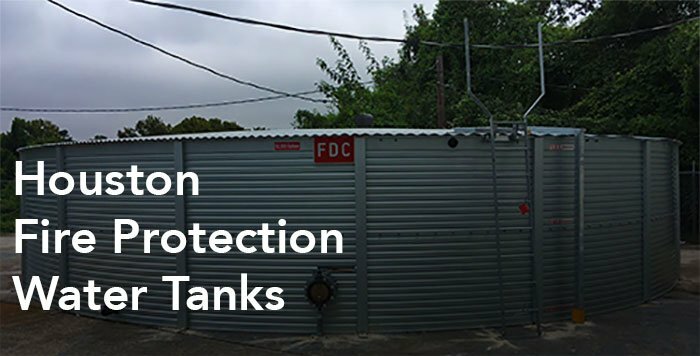 Our tanks are used as a water source for firefighting for properties without any other water source and as a water source for fire departments. Our standard capacities and accessories are quoted to the project requirements to get you the best price possible. California Senate Bill No. 558, or as it was first known as Prop 72, passed and was approved by the Governor on January 31, 2018. 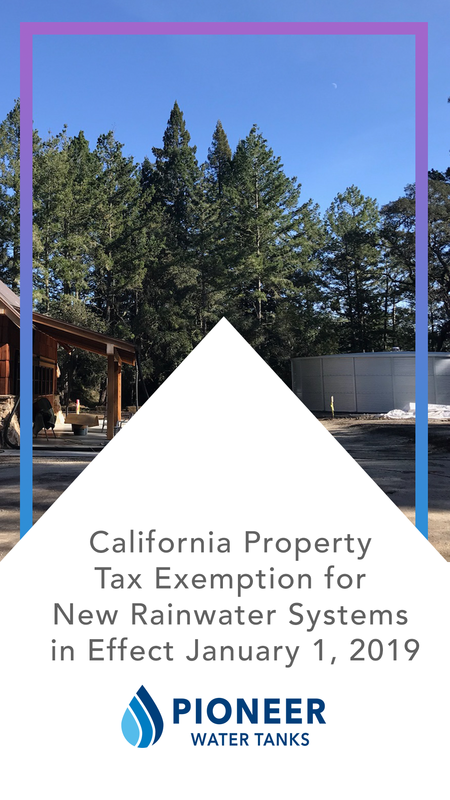 This act added and repealed Section 74.8 of the California Revenue and Taxation Code to exclude property taxes to new construction of rainwater harvesting systems. The Bill is effective January 1, 2019, to promote the use of rainwater systems as a sustainable water source for both homes and businesses. The property tax exclusion applies only until the building changes ownership however the first purchaser of a home with a rainwater system installed can also claim the exclusion when the owner-builder incorporates the system. This applies to the first homeowner as long as the owner-builder had never intended to occupy or use the building, and did not yet claim the exclusion so that the purchaser buys the building before it’s assessed to the owner-builder. 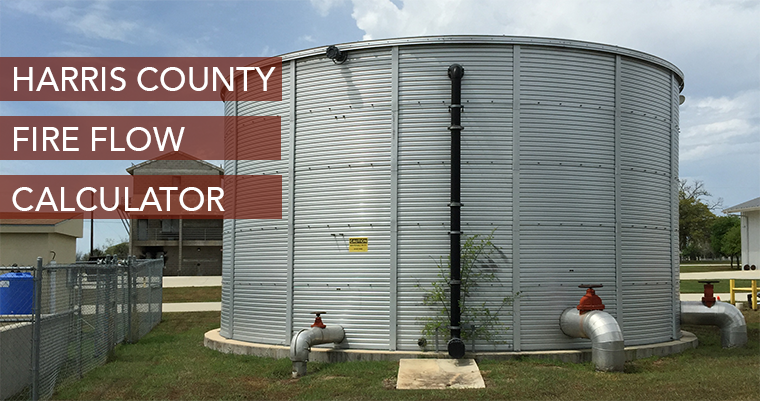 To claim the property tax exemption for new rainwater systems, taxpayers must file a claim with County tax assessors and provide any documentation necessary to identify the value attributable to the rainwater system, including any rebates. 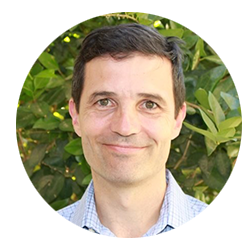 The assessor evaluates the claim and subtracts the value of the rainwater system from the purchase price to determine its new value for property taxes. 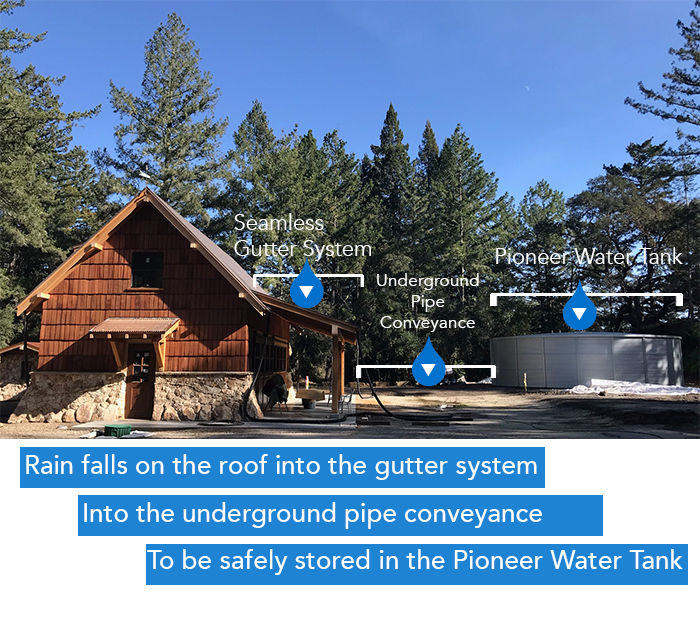 Rainwater systems with Pioneer Water Tanks work well in California since they can be installed with options to add functionality to your systems, like the addition of firefighting nozzles and adapters. Pioneer Water Tanks store the rainwater within the BPA-free, NSF-61 certified for drinking water AQUALINER® Fresh tank liner. The liner storing the water is then protected within the Zincalume Steel tank body that is certified to withstand fire immersion and last without corrosion 200% longer than galvanized steel. Pioneer Water Tanks are the longest-lasting rainwater storage tank, and we include our 20-year warranty to back it. Our systems are delivered in a crate for onsite installation, even in the most rural of areas in California. The California Water Code, section 1201, defines water subject to appropriation and authorizes the State Water Board to grant permits for water flowing in any natural channel. Rooftops are not a natural channel, therefore harvest of rainwater from rooftops does not require a water right permit. The State Water Board encourages methods of water collection or diversion, such as rooftop rainwater harvest, that reduce demand on streams and reduce water quality problems associated with stormwater runoff. The Lower Colorado River Authority offers rebates for rainwater systems to qualifying customers. The LCRA may provide rebates for 50% of the total cost, up to $600, per residential property for upgrades to conserve water and increase efficiency. - Being a Lower Colorado River Authority domestic use customer. - The rainwater system must be for non-potable use. - The system must have a storage capacity of 100 gallons or more. - Receipts and photos of the equipment up for the rebate must be submitted with the application. 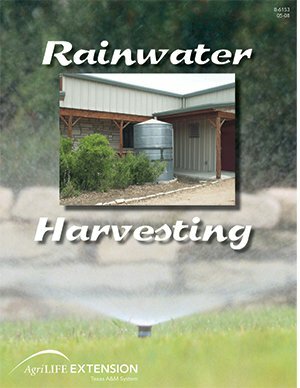 The rainwater harvesting system rebate program is a part of the Highland Lakes Watershed Ordinance to protect water quality as well as is an initiative to respond to stormwater pollution. Rainwater harvesting systems capture rooftop rain runoff for later sustainable use, instead of letting it run off and become possible stormwater pollution. Using a rainwater system for domestic purposes also reduces utility water use that can help with water availability. 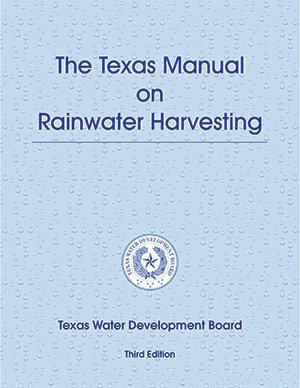 All rainwater collection/harvesting equipment is exempt from sales tax, within the State of Texas, per Section 151.355 of the Texas Tax Code. Link to Tax Code. To claim this exemption, the purchaser must furnish a Tax Exemption Application Form 01‐339 to the supplier at the time of purchase. An itemized receipt must be submitted with the application within 60‐days of installation. The receipt must include date, vendor name and address, the amount paid, and capacity of the tank. The City of New Braunfels in Texas offers rebates for rainwater systems based on $0.50 per gallon of water storage. The maximum rebate allowed is $250 for qualifying New Braunfels utility customers. This compensation program is with the New Braunfels Utility office and is paid as a credit on water billing accounts, so to qualify the business or residence must be a customer of NBU. This rebate program is ending soon, one requirement is that the application is being accepted before July 31, 2017. 1. Systems’ overflow must be designed to prevent erosion or localized flooding. Pioneer Water Tanks’ include the largest overflow on the market with a six-inch diameter to prevent incidents. 2. Rain barrels and tanks should be elevated at least 6 inches off the ground. Pioneer Water Tanks include a sand pad or cement ring beam option that qualifies for this requirement. 3. If a rainwater tank is installed, it must have a first flush system designed to divert and discard the first 10 gallons for every 1000 square foot of rain catchment area. 4. Water storage tanks need to be opaque or painted to prevent light from entering. With a Pioneer Water Tank, this is never an issue since it’s a bolted tank with the water protected within the five-layered Aqualiner tank liner. The liner has a 65-year lifespan and is NSF/ANSI 61 certified as well as BPA-Free. 5. Rain storage openings should be covered with screening small enough to prevent mosquitoes. The filter basket that is included with a Pioneer Water Tank has a thousand count mesh that goes beyond requirements to prevent mosquito and other contamination. 6. The application for the rebate must include a detailed drawing of the catchment vessel location. 7. The rebates can be used for non-potable systems only and cannot be used for drinking. 8. The rainwater systems cannot be connected to NBU’s potable water system. 9. A final inspection of the rainwater storage tank by an NBU Resource Conservation Representative is required to qualify. All rainwater collection/harvesting equipment is exempt from sales tax, within the State of Texas, per Section 151.355 of the Texas Tax Code. To claim this exemption, the purchaser must furnish a Tax Exemption Application Form 01‐339 to the supplier at the time of purchase. The Harris County Fire Code requires enough water supply/pressure, called fire flow, in case of fire emergencies. 507.1 Required water supply. An approved water supply capable of supplying the required fire flow for fire protection shall be provided to premises upon which facilities, buildings or portions of buildings are hereafter constructed or moved into or within the jurisdiction. All New Fire Alarm and Fire Sprinkler Systems require permits and plan submittals in Harris County. New residential and commercial buildings also require permits, with some projects needing a supplemented water supply for fire flow requirements. Pioneer Water Tanks America offers supplemental and complete water storage systems that comply with NFPA 22 Standards for Water Tanks for Private Fire Protection‎. Our standard range of capacities 5,000-Gallons to 1,000,000-Gallons. We can also provide custom capacities, sizes and for different application requirements. Our complete engineering submittal packages provide detailed drawings, engineering calculations, and Texas engineer stamped foundation designs for easier permit submission. Pioneer Water Tanks have full lines of commercial accessories to fulfill local authority requirements to make your tank multifunctional. We support a nationwide dealer and installation network that can provide an efficient, onsite, accredited installation without the use of heavy machinery. Pioneer Water Tanks are installed with our proprietary jacking system for larger industrial projects within a week. Pioneer Water Tanks are proven to be a reliable water source that can include fire hose hookups as well as firefighting nozzles. The cost-effective capacity can also double as an emergency water source since the tank liner is NSF 61 certified for drinking water. 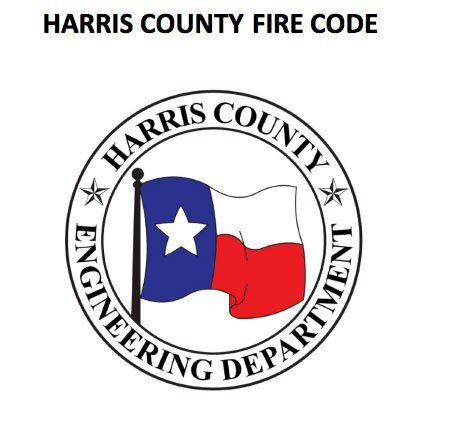 Harris County requires permits and plan submittals for new fire alarm and fire sprinkler systems to include providing the required water supply, the fire flow, for the building. FIRE-FLOW: The flow rate of a water supply, measured at 20 pounds per square inch (psi) (138 kPa) residual pressure, that is available for fire fighting. FIRE-FLOW CALCULATION AREA: The floor area, in square feet (m2) used to determine the required fire flow. 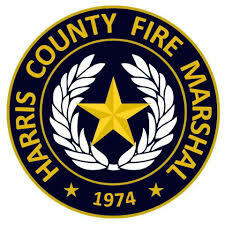 The Harris County Fire Flow worksheet is based off of the National Fire Academy (NFA) method of calculating fire flow. Example: For a 30' x 50' building that’s 25 percent involved, the flow would be 30 x 50 = 1,500 square feet, divided by 3 = 500 x 0.25 = 125 GPM. 508.1 Required water supply. An approved water supply capable of supplying the required fire flow for fire protection shall be provided to premises upon which facilities, buildings or portions of buildings are hereafter constructed or moved into or within the jurisdiction. A water supply as otherwise required by this section will not be required if the responsible emergency services district or fire department provides a letter stating they can provide sufficient fire flow for the specific project. 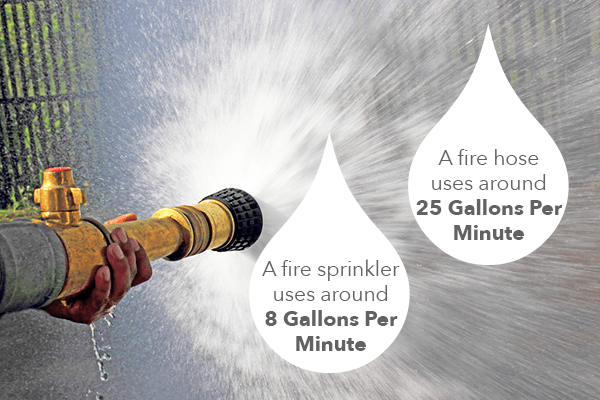 One fire sprinkler can use on average eight gallons-per-minute (GPM). Most home fire sprinkler systems accommodate two simultaneous flowing sprinklers, with a minimum need of 16 GPM to supply them with water. The size of a house, local building requirements and the water source may require more sprinklers or be required at a higher pump rate. One or two sprinklers must flow for a minimum of 7-10 minutes, which can be provided by a well tank or a rainwater tank when sprinklers are not supplied by a water distribution system. Fire sprinkler systems that aren’t supplied enough by a utility water source, need an on hand water supply of at least 15% of the total required fire flow (but exact percentage is based on local authority requirements). Additional water storage ensures that your property has water on hand for emergencies, typically with its own pump system that won’t go down in case of electricity failure. This becomes even more important, if not required, based on how rural the property location is. Rural water distribution systems that are found to be inadequate to supply 16 GPM for fire sprinklers, would probably fall short of the minimum code-required plumbing demand, and it would surely fall far short of the 1,000+ GPM needed from fire hydrants to support a fire department extinguishing a fire in a home without a sprinkler system. In order to figure out the exact fire flow requirements, refer to the local Fire and Building Codes, as well as refer to the local pre-inspection requirements. If fire flow must be measured in regards to the local Fire Code, the ICC International Code Council provides a chart to show fire flow requirements based on the of building construction and square footage. The ICC Construction Types that determine the fire flow, are listed in the drop-down below. The calculation uses the ICC minimum required fire-flow and flow duration for buildings. TYPE I-A--Fire Resistive Non-combustible (Commonly found in high-rise buildings and Group I occupancies). TYPE I-B--Fire Resistive Non-Combustible (Commonly found in mid-rise office & Group R buildings). TYPE II-A--Protected Non-Combustible (Commonly found in newer school buildings). Building constructed of non-combustible materials but these materials have no fire resistance. wooden roof or floor assembly which is 1-hour fire protected). No fire resistance for structural frame, floors, ceilings, or roofs. 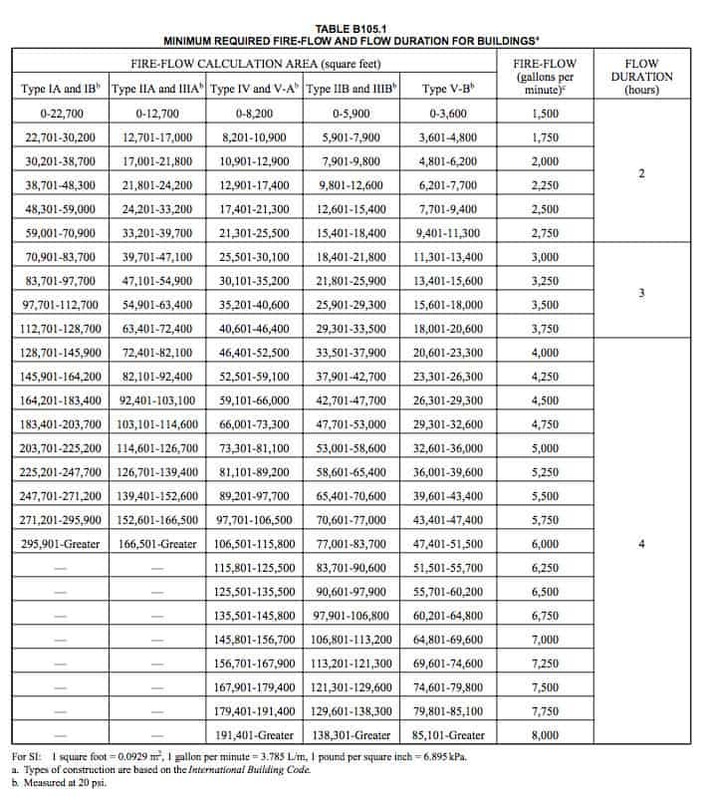 The following calculation uses the ICC Fire Flow based on the above construction types of square footage of the building. The chart below reflects the calculation as well. 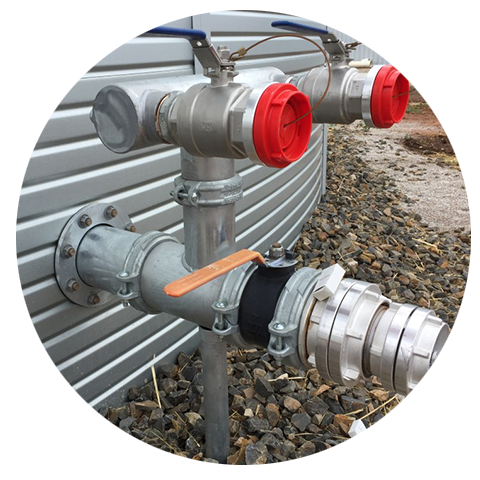 We provide water storage for fire protection, with a full line of NFPA compliant firefighting adapter and nozzle options. Get your best price on water storage with Pioneer Water Tanks America localized dealer and installation network. Rainwater can be collected off of a rooftop as a sustainable water source and stored in a Pioneer Water Tank for later use. Depending on the system set up, the rainwater can be used for domestic and in some cases, as the primary drinking water source. Rainwater systems vary from a simple barrel set up to completely supplying water for a building or home and can be used as a water source for firefighting. There are even rainwater systems set up as a wildlife water source or as a stormwater management technique. Using a rainwater system is beneficial because it reduces demand on existing water supply, and reduces runoff, erosion, and contamination of surface water. When designing a rainwater system, the first step is to decide the goal and use of the water. Storing the rainwater in the right capacity and properly is key to avoiding contamination and overflow. Rainwater tanks must be properly screened and secured without allowing sunlight into the tank. Rainwater storage tanks must have an inlet, outlet, overflow, vent, and inspection or service port. Pioneer Water Tanks were engineered to protect water from the very start. The entire design and quality materials are chosen as the best possible way to keep water fresh and clean. - All of our standard accessories, as well as our optional additions, are to improve the quality of rainwater stored. This includes filtering rainwater through a thousand count mesh filter, and including an inlet, outlet, overflow pipe and vent specified for drinking water storage tanks. The quality of the rainwater tank determines how well the water will be stored for later use. Using a poly tank, for example, will mean that it shouldn’t be used as a drinking water source because of leaching but it should still be properly sealed to prevent mosquitos. There are places like Hawaii that see cases of diseases from water contamination including Leptospirosis. Preventing contamination should be the primary goal of your rainwater tank with filtration post-storage if used as a drinking water source. Pioneer Water Tanks are engineered as the top-tier rainwater tank to protect your water supply from contamination. They are implemented worldwide for their longevity and quality of storage that is proven to keep your water fresher for longer. If you would like to store rainwater in a large capacity, get started with your local Pioneer Water Tanks accredited dealer for your best price. The City of Round Rock, Texas offers rebates for rainwater systems for qualifying residents. City of Round Rock water customers are eligible, while MUD customers are not. The City is incentivizing rainwater systems as a water conservation effort to reduce utility water use for irrigation. The maximum rebate offered is $600 per qualifying resident, per year. The rebate can be used only for non-potable systems to use for irrigation and other domestic purposes. The City rebate is intended to go towards the cost of the water storage tank, pad material, pump, pipes, and gutters if needed. The system cannot be connected to the City’s water supply. - An itemized receipt must be submitted with the application within 60‐days of installation. The receipt must include date, vendor name and address, the amount paid, and capacity of the tank. - The applicant is responsible for obtaining HOA approval, if applicable. 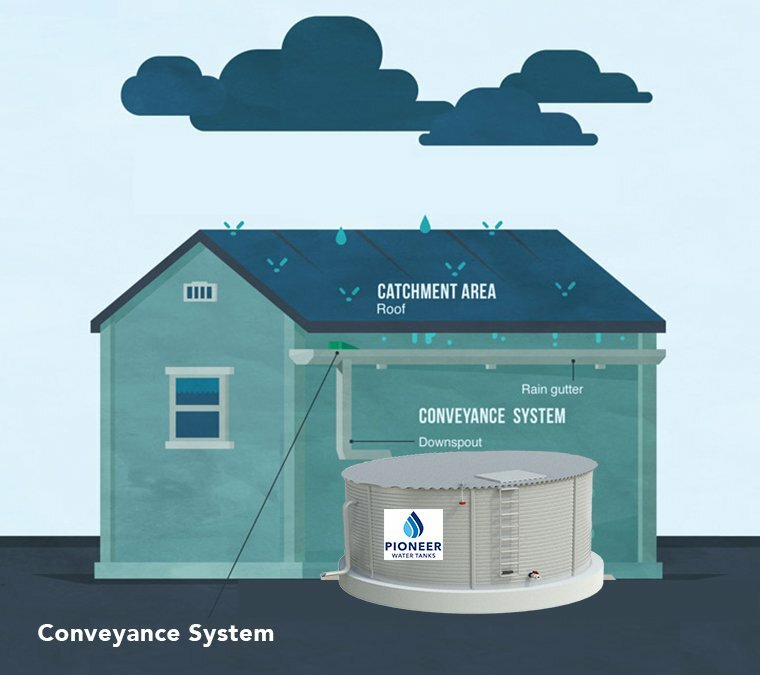 HOAs cannot prohibit rainwater harvesting in the City of Round Rock; however, they may dictate where the system may be located on your property. - Rebates are available until funds have been expended. Visit roundrocktexas.gov/rebates for available rebates. Once funds are exhausted the rebate program will no longer appear on the website.